International brand with French origin, Citroën is promoting the French creation and continuing its creative collaboration with Jean-Charles de Castelbajac, by revealing C3 JCC+ limited edition exclusively at the 2018 Paris Motor Show. The designer has a talent for transcending barriers between different worlds and has now turned his attention to the brand's best-seller, which has sold 400,000 units. Taking a very different approach to the highly chromatic E-MEHARI Art Car unveiled last May, this C3 “fashion car” displays the elegance of a black dress subtly set off in the designer’s colours: Red, Blue and Yellow. This eye-catching limited edition produced in just 99 units also proclaims its modernity with a whole host of technologies. Also modern in its way to be sold with an online sale on the citroen.fr website. C3 JCC+ limited edition will be presented at La Maison Citroën stand in the area dedicated to designer Jean-Charles de Castelbajac and marketed in France in november. When two names associated with French visionaries and agitators come together, it heralds an impressive creative energy. The first instalment came last May with the E-MEHARI Art Car, celebrating the 50th anniversary of a true icon. Sharing the same values ​​of boldness and optimism as the designer, Citroën entrusted E-MEHARI, a four-seater all-electric convertible, to Jean-Charles de Castelbajac. He kept it true to the Méhari spirit, while instilling freshness and exuberance.It was a highly contrasting, poetic and chromatic work, which inspired a desire to push the boundaries. This natural encounter, merging two worlds, has now produced a limited edition called C3 JCC+. Based on the third generation C3 – the bestseller in the range, with more than 400,000 sales worldwide since its launch – this new creation by Jean-Charles de Castelbajac takes the form of a Fashion Car! French fashion and creativity come to La Maison Citroën at the Paris Motor Show. Alongside the E-MEHARI Art Car designed by Jean-Charles de Castelbajac, Citroën C3 JCC+ limited edition will also be unveiled to the public. These two models, presented in two stacked boxes, flaunt their character and contrasts – the electric cabriolet, arty and colourful, and the versatile city car, elegant and sassy. 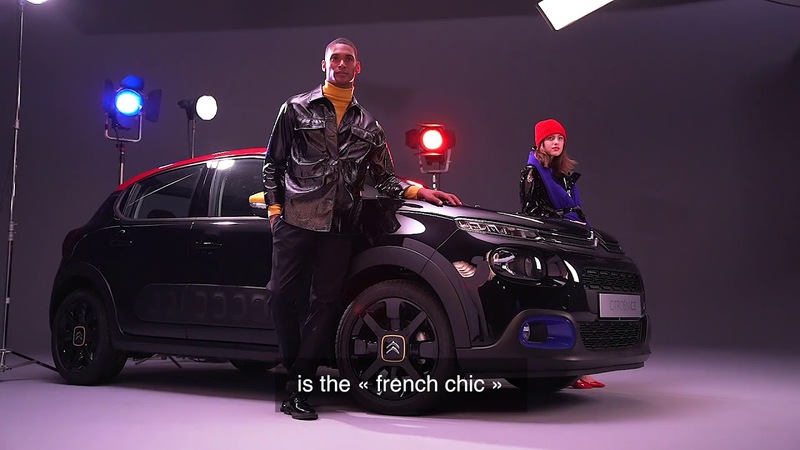 Once again, Jean-Charles de Castelbajac appeals to creative minds and again, through Citroën C3 JCC+, expresses his two reasons for living – art and fashion. With a focus on refinement, this limited edition, monogrammed with the designer's signature, JCC+, offers a very high-end version of the C3. Sporting a black dress set off in the designer’s iconic colours – Red for passion, Blue for hope, Yellow for sunshine – it will appeal to lovers of art, design and fashion who are looking for a versatile and exclusive model! A trendy and versatile vehicle thanks to its styling and high potential for customisation, C3 becomes even more elegant and packed with character in this unique version. Citroën C3 JCC+ limited edition is personalised both inside and out. Aesthetically, C3 JCC+ limited edition stands out at first glance for its Perla Nera Black body, its Aden Red roof, its tinted windows, its Black Airbumps® and its 17'' CROSS Black alloy wheels. The artist's touch can be seen in the roof capsule, with its special chevron decoration, and on the rear door and in the rear quarter panel incorporating the Blue JCC+ monogram. The colourful highlighting of the Airbump® surrounds and fog light covers is blue, while the yellow wheel cap surrounds echo the shells of the wing-mirrors. The same interplay of colour contrasts can be seen on Citroën C3 JCC+, with the red banner of the upholstery specific to the Urban Red Ambience and two touches of yellow added to the steering-wheel insert strip and the outline of the gear lever. The dashboard surround, meanwhile, adds a touch of blue. Further evidence of the attention to detail paid by Citroën and Jean-Charles de Castelbajac comes in the form of a sun-visor mirror with JCC+ sticker and with JCC+ monogrammed front mats and coloured stitching (Yellow on the driver side and Red on the passenger side). - Reversing camera and blind-spot monitoring system. C3 JCC+ benefits from the very best know-how in the C3 range, with the PureTech 110 S&S petrol engine combined with an EAT6 automatic gearbox. It will also be possible to order this limited edition throughout the network.